by Pope Francis on July 11, 2016. At the centre of the Coat of Arms is the open word of God. On the book is the Latin phrase “Verbum Vitae,” that is, “the Word of Life.” The text comes in the first instance from the First Letter of John: “We declare to you what was from the beginning, what we have heard, what we have seen with our eyes, what we have looked at and touched with our hands, the word of life...” (1 Jn. 1:1). St. Paul also admonishes his hearers to “hold fast to the word of life”(Phil. 2:16). The shepherd’s crook – a bishop’s staff or “crosier”– represents the apostolic calling to be a good shepherd, to feed the sheep, to take care of the lambs (Jn.10; Jn. 21). The sword is the traditional symbol of St. Paul, who is the patron of the Roman Catholic Diocese of Saskatoon. The wheat sheaf, against the blue backdrop, speaks in the first instance of the Saskatchewan prairies under vast sheltering skies. Jesus also speaks of his own paschal mystery in terms of the grain of wheat which falls to the ground and dies, and bears much fruit (Jn. 12:24). Wheat is also thus a symbol of the Eucharist, of the Lord’s invitation to receive his life-giving presence into our lives, to allow our lives to be broken and poured out for others. The shell is abundantly present in the iconography found within the Oratory of St. Francis Xavier “del Caravita” where Bishop Bolen served on the pastoral staff during his years in Rome, and which symbolizes one of four miracles attributed to the Jesuit saint during a missionary voyage to Malacca in 1546. As the wheat symbolizes Eucharist, the shell symbolizes Baptism; together they point to the sacramental life of the Church, but also to ecumenical efforts to come to a shared sacramental life. The hat with six tassels on either side and the cross are emblematic of the hierarchical status of the episcopal office, and are present on every Roman Catholic bishop’s coat of arms. The Jerusalem Cross, depicted here, is often associated with the Knights of the Holy Sepulchre. As with every cross it symbolizes the paschal mystery, but the specific associations with the Jerusalem Cross evoke in a particular way the Holy Sepulchre, the place where the crucified Lord was buried, and where God raised him from the dead. 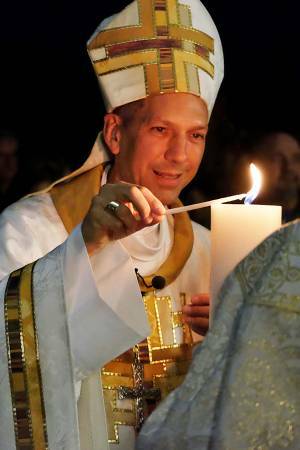 REGINA…….Two days after the October 12, 25th anniversary of his ordination to the priesthood, Donald Bolen was installed as Archbishop of the Regina Archdiocese. It was a coming home for the popular priest who was born in Gravelbourg in the Archdiocese of Regina, obtained his early and some post secondary education at Campion College, University of Regina, ordained priest October 12, 1991, spent seven years in Rome, a short stint as Regina Archdiocese Vicar General prior to his March 10, 2010 appointment as Bishop of Saskatoon where he served until appointed Archbishop of Regina by Pope Francis, July 11, 2016. It was all fun and laughter, with one poignant moment as more than 200 invited guests attended a banquet at Resurrection Parish prior to the installation of Donald Bolen as Archbishop of the Regina Archdiocese (See separate story). Wednesday night in Saskatoon, we celebrated a farewell Mass, and Fr. Lorne Crozon attended the celebration and spoke a few words on behalf of the people of the Archdiocese of Regina. He said “we’re not stealing your bishop. We’re simply taking him back.” Thank you for taking me back. While it was difficult to leave Saskatoon, it is very good to be home, and even as I am being welcomed, it is a blessing to be able to join in welcoming so many other people here tonight, in the Cathedral and in the hall below, from near and far, and others following by live stream. REGINA - Anglicans in the Diocese of Qu'Appelle are welcoming the announcement by Pope Francis that Bishop Don Bolen of Saskatoon will be the next Roman Catholic Archbishop of Regina. Speaking from Toronto, where he is attending the General Synod of the Anglican Church of Canada, Bishop of Qu'Appelle, Rob Hardwick said, "This is wonderful news. Archbishop Bolen has been a faithful partner in the Gospel. I look forward to working with him to advance our shared mission." Grace and peace to you in the Lord Jesus Christ. By now you will have received the news that I have been appointed by Pope Francis as the Archbishop of Regina. I write this note with many and conflicting emotions, held together by a deep and abiding trust in God’s mercy and faithfulness. After the death of Most Rev. Archbishop Daniel Bohan, most people of the Archdiocese of Regina may wonder how a new Archbishop would be chosen. I would like to take this opportunity to share with you the process for selecting a bishop. Who has the authority to choose a new bishop? The short answer is the Pope with the help of the Holy Spirit. Remember, Christ has not abandoned his Church, and continues to guide and govern her through the Holy Spirit. Basically, the Pope can appoint any Catholic priest to be a bishop, the actual process usually involves many people. This process can be seen in two parts: first selecting the right priests, and secondly, choosing the one who best fills a specific vacant See. ”Pope Francis would be pleased to hear what is here,” said Apostolic Nuncio Archbishop Luigi Bonazzi after he received briefings from all eight of the Saskatchewan School Divisions. It was the first day of a week-long Saskatchewan visit that had him bless and dedicate the Sisters Legacy Monument in Wascana Park (see PM October 7 issue), visit all Saskatchewan Catholic dioceses and visit Catholic schools in each diocese. He finished the week with a full day in Regina, beginning with breakfast at the Hotel Saskatchewan, meeting recipients of Papal Honours and other guests, touring several Regina Catholic schools then celebrating an evening mass to mark the centennial of Regina becoming an Archdiocese.